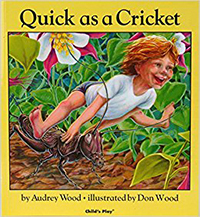 Audrey Wood started her career with Child's Play, and is now one of this country's best-known authors for children. Often, she works with her husband, Don, as the illustrator, and their recent books are published by Simon & Schuster and HBJ. Audrey and Don live with their son Bruce in Santa Barbara, CA. A celebration of a child’s growing self-awareness, and a prime example of how books can contribute to this. Whether brave or shy, strong or weak, in the end the young boy celebrates all different, apparently contradictory parts of himself.